The (-: Buddhist...: Nama Arya Avalokiteshvara Bodhisattva Mahasattva Mahakarunakaya! Nama Arya Avalokiteshvara Bodhisattva Mahasattva Mahakarunakaya! Namo Great Compassionate Avalokitheshvara Pusa! Om Mani Padme Hum! Come August 1st (Chinese Calender: 6th Lunar Month, 19th day) , The enlightenment anniversary of Bodhisattva Mahasattva Great Compassionate Guan Shi Yin shall be celebrated by Mahayana Buddhists. The beloved Compassionate One's anniversary is celebrated 3 times a year. Chinese calender : 2nd lunar Month, 19th day, 6th lunr month, 19th day, 9th lunar month 19th day. 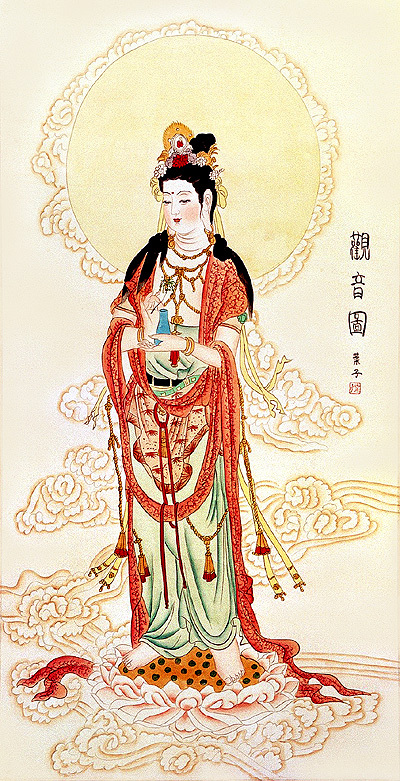 Why is Guan Shi Yin is so popular and dear to us here within the Samsara world? It's simply because Guan Yin has affinities with us. Along with another Great Bodhisattva, Ksitigarbha Bodhisattva (Di Zang PuSa). Together with our Buddha Sakyamuni, the 3 Saha Sages looks after our samsara world. As Guan Shi Yin's anniversary is coming soon. I have devoted this blog to the Great compassionate one. One with a thousand hands and eyes looking in all ten directions to respond to the cries of all sentient beings. One with 33 transformation bodies and multiple awesome spiritual powers. The Blue neck and whose 6 syllable true words resonate with your heart. One who is also a transformation of the Mother of 7 Koti Buddhas, and whose tears arose out of compassion gave birth to the Green and White goddesses. Unworthy disciple, with 7 limbs on the ground, making 5 fold prostrations, sincerely request Guan Shi Yin Bodhisattva to be ever closer to all of us, guide us and teach us so we can realize our own error and we shall not commit more karmic offenses. Guide us so we can dwell in the blissfulness of the Dharma and be in your state of mind. The Buddha told Inexhaustible Intention Bodhisattva, "Good man, if living beings in this land must be saved by means of someone in the body of a Buddha, Guanshiyin Bodhisattva will manifest itt the body of a Buddha and speak Dharma for them. Amazing post, it's been awhile since I have read tales of Bodhisattva Avalokiteshvara, Bodhisattva of Compassion. Dear Peter, Thank you for your compliment. Spreading Metta and Compassion to KL!!!! Kill your karma! Do it the diamond way! I.O.U = I owe too many!